Only FIVE ingredients and ten minutes prep to make these delicious cheesecake-filled cinnamon rolls. The cheesecake filling doesn’t require any baking. Hi! My name is Chelsea ?? and I’m addicted to cheesecake-filled cinnamon rolls. Please send help. But seriously. 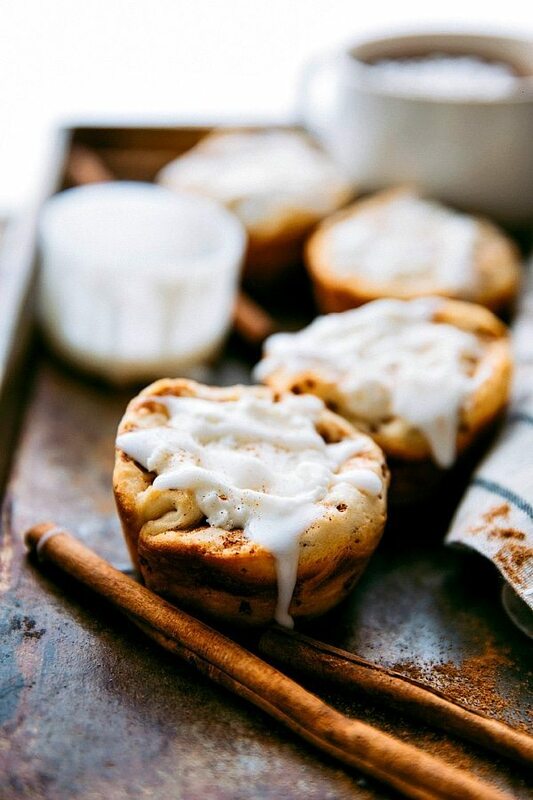 We have made and eaten these cheesecake-filled cinnamon rolls way, way too often lately. 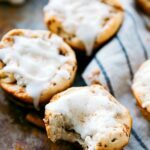 I debated and debated and almost didn’t share this recipe since it’s pretty much exactly the same as the orange cinnamon roll cheesecake stuffed rolls that I shared a couple of weeks ago. But I finally decided just in case you hadn’t thought of making these in regular cinnamon roll fashion (no orange), I thought I’d share them. That, and, these happen to be the husband’s favorite (mine are still the orange ones). PLUS. Christmas is in only in 3 days and you need a crazy delicious breakfast that is really easy to make right? Annnnd the cheesecake filling can even be made the night before so it really would make for a fast and easy Christmas breakfast. And finally, I’m pretty sure Christmas is one of the few days of the year that this recipe can be rationalized as a breakfast. ? So…just do it! Alright, so if you want to see a very quick video on how easy these are to make, be sure to check it out on YouTube. P.S. Have you subscribed to my channel yet? I don’t want to be annoying and ask everyone, but, um, I only do have so much family to beg… ? I hope you are all enjoying the videos. I’m trying to make them as helpful as possible, but I’d love suggestions you have for me on what you’d like to see. Especially since the new year is approaching quickly and I’m currently making lots of plans and goals for CMA. I’m pretty excited for some of the things I’ll be rolling out in 2016. It’s going to be a great year with lots of delicious food! ? Back on topic though…these are an unique dessert/breakfast (?) that are sweet and rich while still being a lighter (not heavy filling) treat. They almost remind me of an ice cream sundae treat — the cinnamon roll is still slightly warm and the cheesecake filling is cold. The icing topping just ties it all together. 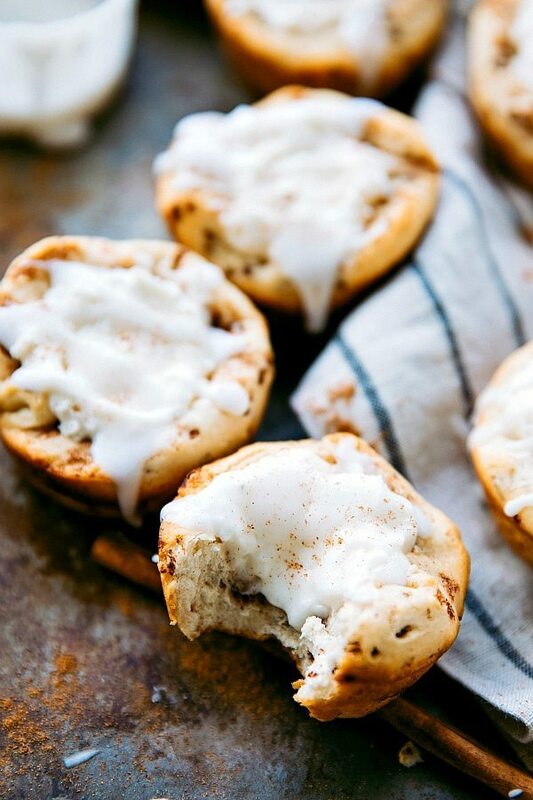 They aren’t overly cheesecake-y, but more of an ultra-iced cinnamon roll. The cheesecake filling tastes like a lighter version of cream cheese frosting (less sugar, more cream cheese). 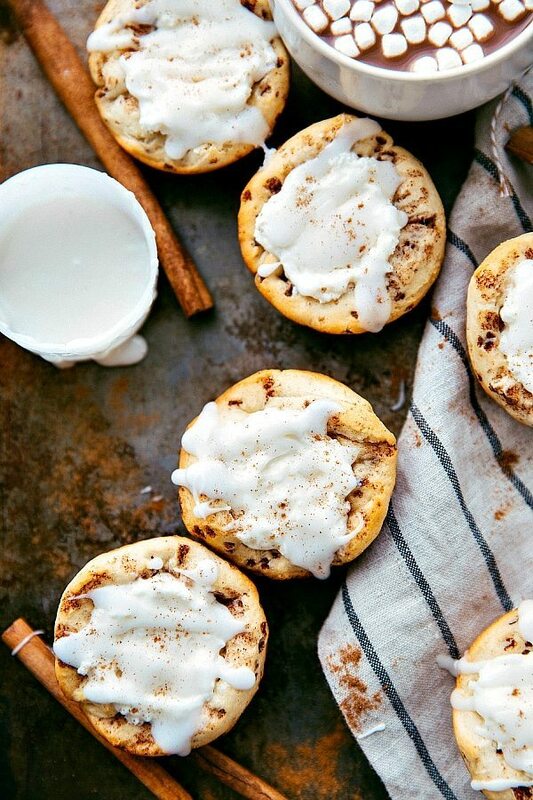 Serve ’em with some hot chocolate and they make a delicious wintery treat! And I believe there is just one last treat to share this December and then it’s on to lots of healthy food. I’ve got healthier baked goods, healthier dinners (soups and salads! ), and some healthier snacks coming at cha for the end of December and throughout January! But, before then, eat as many of these as possible. ? Remove the cinnamon rolls from the containers and set aside the icing. 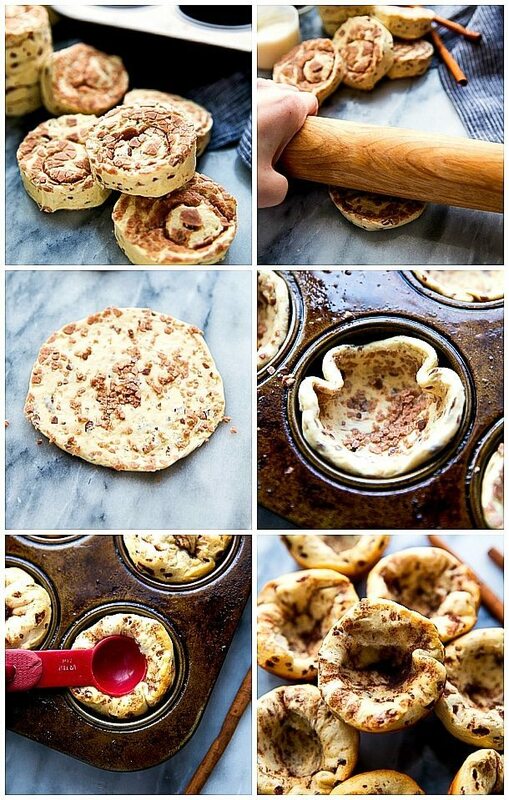 Evenly place each rolled out cinnamon roll into an individual cavity in the muffin tin. Warm the reserved icing in the microwave for 10 seconds and then generously drizzle evenly on top of the rolls. Put a pinch of some extra cinnamon on top of each roll if desired. If you want to make these ahead of time, make the filling and store in the fridge. Roll out the cinnamon rolls and cover in the fridge. When ready to enjoy, bake the cinnamon rolls about 15 minutes before serving to give them 10 minutes cooking time and about 5 minutes cooling time before filling with the chilled cheesecake filling. 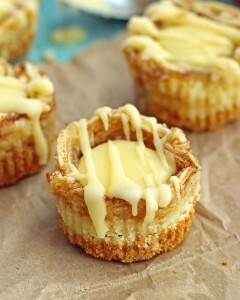 This recipe halves easily -- just use 1 container of cinnamon rolls and halve the filling recipe if desired. 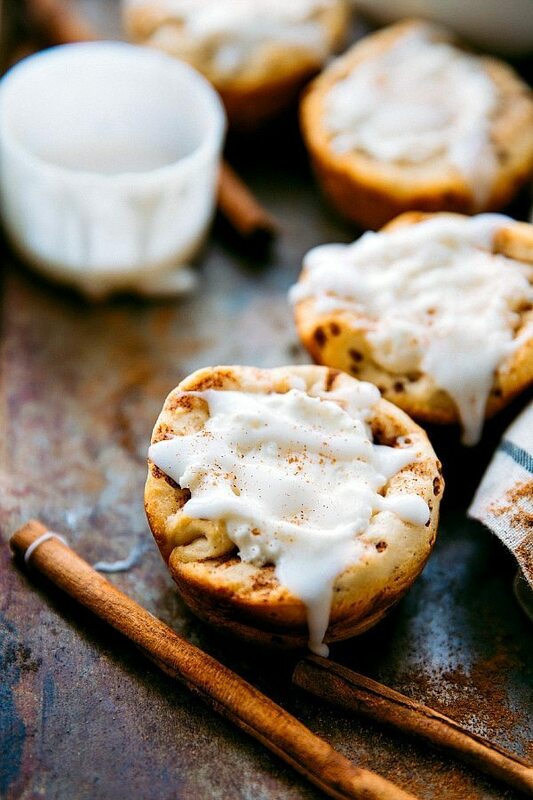 Oh these cinnamon rolls look amazing!! Merry christmas Chelsea to you and your family!! boy oh boy those certainly look delicious and a little bit dangerous. Fantastic recipe, pinned! I love this recipe so much. You are one smart cookie! These look amazing, I can’t wait to try this out! Oh you are speaking right to my stomach! These are drool-worthy! Yum! Your pictures are phenomenal Chelsea! I just want to grab these rolls through my screen! Have a lovely weekend! Hey there, I’m a huge fan of cheesecakes look way awesome! Amazing pictures Chelsea! I’m also gonna pin this post on my Pinterest board my followers will love it. Can i post it on my blog too?